East Troy, WI - Today a national ad hoc coalition, Awareness for Victims of Canine Attack (AVOCA), releases an open letter to Arianna Huffington, the chair, president and editor-in-chief of the Huffington Post Media Group, which includes The Huffington Post. The letter urges Ms. Huffington to reconsider her publication's stance on the promotion of pit bulls as family pets and comes in response to The Huffington Post's "Pit Bull Week" that was featured at the end of July. AVOCA releases the open letter to Arianna Huffington -- signed by over one hundred parents, survivors of vicious dog attacks and victims' advocates -- during the first-ever Canine Victims Awareness Week. 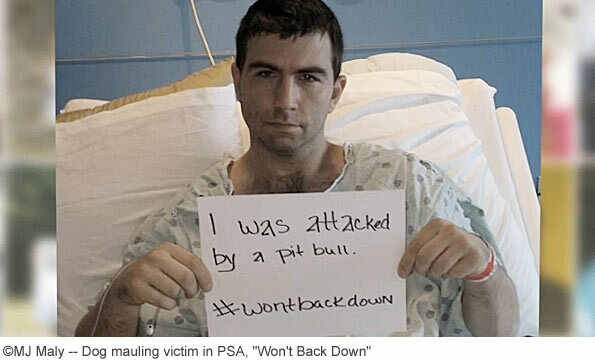 On Monday, the same group released its first in a series of Public Service Announcements titled, "Won't Back Down," that features dozens of photos of family members, dog attack survivors and safety advocates holding up signs with the hashtag #WontBackDown. The open letter to Arianna Huffington outlines the emotional and physical devastation experienced by canine attack victims, as well as the overwhelming financial cost of medical treatment, according to the group's press release. Thus, "as a support and advocacy network of victims' of dangerous dogs," states the release, AVOCA "cautions The Huffington Post that encouraging the proliferation of fighting breeds as family pets is ill-advised and even potentially deadly." The open letter, "An Open Letter to Arianna Huffington Regarding the Promotion of Pit Bulls" is located on the Daxton's Friends website at the following URL: www.daxtonsfriends.com/open-letter-huffpo. We encourage all DogsBite.org followers to read it in full. DogsBite.org (Texas), Daxton's Friends for Canine Education and Awareness (Wisconsin) and Citizens for Canine Attack Prevention (Illinois) are all participating in Canine Victims Awareness Week with AVOCA. DogsBite.org has selected a portion of the open letter to show readers just how reckless The Huffington Post's, "pit bull advocacy" has become. The HuffPost has been on our radar for a number of years, beginning in 2009 when we responded to a pro-pit bull piece by Carrie Pollare (See: I'm Tired of "Pit Bulls Before People"). In 2010, we began calling the publication, "PuffPo" after editors removed a male, unaltered, chained pit bull from their 9 Most Dangerous Pet list. We never would have imagined, however, that by July of 2014, HuffPost would have a dedicated "HuffPost Pit Bulls" section of their website, promoted a special "Pit Bull Week," specifically designed to rebrand pit bulls as safe family pets, and finally, strongly promoting a children's book about pit bulls that author Douglas Anthony Cooper states, "no conventional publishing house will go near [the book]." We were told: "You might as well write a children's book about meth." 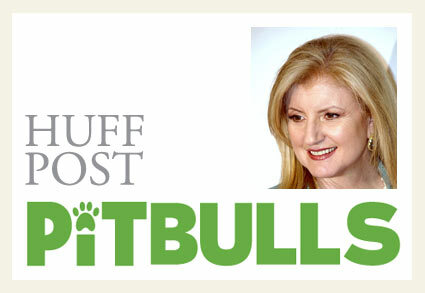 The Huffington Post has become a premier outlet for the rebranding of pit bulls. On “Pit Bull Awareness Day” last year (October 2013), your publication posted, “Your Kids and Pit Bulls Love Each Other.” Readers were invited to submit photos of their children hugging and kissing their pit bulls. Over a hundred photos appeared in the slideshow, but one in particular caught our eye -- that of poor little Nephi Selu who’d been mauled to death by his “best friend”, a pit bull named Kava. In the photo, sweetly smiling Nephi hugs Kava around the neck. We were horrified to see that photo in the slideshow and alerted your publication to this grievous error. Your photo editors quietly removed the picture, offering no apology. Such a misstep, however, did not deter HuffPost’s pit bull promotion team from boosting their efforts. With the creation of “Pit Bull Week,” the editorial team ramped up the propagandizing even further, devoting an entire new section of your website (“HuffPost Pit Bulls”) to the pushing of this “misunderstood and maligned” breed that kills more people than all other dog breeds combined. So very seductive is this false concept that pit bulls and children belong together that novelist and HuffPost blogger Douglas Anthony Cooper felt compelled to write a children’s book (and accompanying essay for parents) called Galunker, which is due for release later this year, about the eponymous “misunderstood but lovable” pit bull. The Huffington Post serialized the storybook in May of this year in a post entitled “Children Need Pit Bulls: A Picture Book” which, no doubt, helped Mr. Cooper’s Kickstarter campaign to quickly earn $62,000 (over double its original target). In an opinion piece for Animals 24-7, National Post columnist Barbara Kay reviewed HuffPost’s advance copy of Galunker and concluded, “To imply that a real-life Galunker would be ‘about as dangerous as a marshmallow’ is a stunningly -- one might reasonably say a dangerously -- misleading statement." This blog post is part of a special series DogsBite.org is running for the first ever Canine Victims Awareness Week, November 9-15, 2014. Learn more by visiting the AVOCA website.